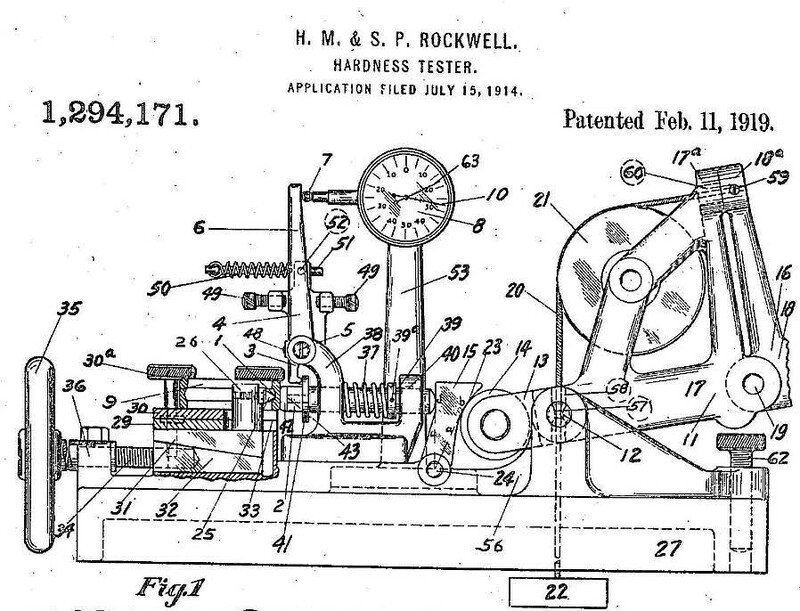 On February 11, 1919, Hugh Rockwell and Stanley Rockwell received a patent for the Rockwell hardness tester, a device for measuring the resistance of metallic materials to force. Though they were unrelated, both men worked for the New Departure Company in Bristol. An aviator and automobile enthusiast, Hugh was the son of Albert Rockwell, one of the company’s founders, and Stanley worked as a metallurgist. Founded in 1888, the New Departure Bell Company began by making doorbells. It then patented a new type of coaster brake and by 1908 had developed the double row bearing. An evolution in design, the bearing consisted of a ring-shaped track containing a double row of freely revolving metal balls. These bearings played an increasingly important role in the construction of automobiles—a new and rapidly expanding industry—and New Departure became the leading bearings manufacturer. By 1916, the company had become part of United Motors. The hardness tester developed out of the need for a machine that could quickly and easily measure the effects of heat treatment on the bearing raceway, or track. (Determining hardness provides information on the durability, strength, and flexibility of the material being tested.) A common method of measuring hardness involved attempting to indent the material being tested by pressing a sharp object into its surface using increasing amounts of pressure. Hugh and Stanley expanded upon the traditional indention test by using a conical diamond for the indention media and basing the test results on displacement. The main advantages of the Rockwell test were the much smaller area of indentation needed to obtain a measurement and the fact that the test could be performed on curved as well as flat surfaces. Both Hugh and Stanley had moved on from the company before receiving approval for their patent application. In 1924, Stanley Rockwell began the commercial production of Rockwell testers with an instrument manufacturer in Hartford, Charles H. Wilson. This company grew into the Wilson Mechanical Instrument Company. The Rockwell hardness test remains the most efficient and widely used hardness test today and is recognized as one of the 20th century’s metallurgical innovations. Rockwell, Hugh M., and Stanley P. Rockwell. Patent Number 1,294,171 - Hardness Tester. 1,294,171. Bristol, CT, issued February 11, 1919. Link.